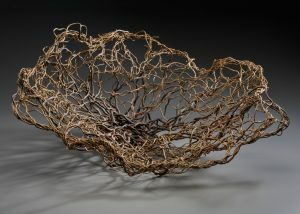 I am happy to share the news that I had my piece, Curly Willow Nest, accepted into the Juried National Exhibition called Unity and Diversity. This exhibition is part of the 2009 Cheongju International Craft Biennale in Korea. Canada is the official guest country at the Biennale this year which provides a wonderful opportunity to have 212 Canadian artists featured in an International Event. The exhibit runs from Sept. 23 – Nov. 1, 2009.